Last week’s Earth Day celebration passed with the usual green this and eco that. But this year also brought more attention to how both Earth Day and the concept of green have started to lose a bit of their shine, with their cooption by multinational corporations and other companies trying to cash in on our desire to do good. There’s also the growing revelation that taking those itty bitty steps for the planet, while better than nothing, isn’t nearly enough to save us – or the earth – from ourselves. 2. Stabilize the bottom billion. 3. Create a globally transparent society. 6. Enable a future forward diet. 8. Negotiate an effective climate treaty. 9. Build bright green cities. 10. Build no new highways. If you check out the full post, you can see their explanations about the problems that each of these concepts solves and why it’s important. 1. Integrate comprehensive humane education and MOGO living into all areas of our lives. If we’re taught from a young age to live with integrity, compassion and wisdom; if we’re given the tools and knowledge to put our deepest values into action; if we learn to pay attention to the impact of our choices and to do the most good and least harm for all people, animals and the planet; if we’re encouraged to think critically and creatively and to find solutions that work for all; if we’re inspired to look at the world through a lens of interconnectedness; if we’re empowered to make positive personal choices and to transform systems, we can create a truly humane world. We’re going to have a challenging time accomplishing all that other stuff on their list if we don’t collectively have the passion, the skills and the integrity to create that world, and those are things that have to be nurtured and taught. Many Americans have come to realize that we need clean, sustainable, just energy solutions. On Saturday, April 18, across the U.S., students, business leaders and engaged citizens will connect with their elected officials in town hall meetings focused on determining local and national energy solutions that also promote jobs, cooperation and respect for the planet. Focus the Nation is the organization sponsoring this “Nationwide Town Hall on a Just and Clean Energy Future.” Find out more about events in your area, or if you want to organize your own event, download the organizing guide. I have a friend who has written to legislators, corporations, and other leaders and officials since she was in high school, and she has kept a big binder of all the letters she’s written – and any responses she has received. That’s not the only citizen activism in which she has engaged, but she has certainly made sure that her voice and her views have been heard by hundreds, if not thousands, of people in power. I’ve discovered through some of my own letter-writing to officials that issues (and better solutions to problems) I assumed they would already know about are frequently unknown to them. I’ve learned not to make assumptions about what people at any level of authority know and to do what I can to help educate, inspire and empower them…and to offer positive suggestions and praise as often as I express my concerns and complaints. Whenever we take the time and courage to speak our piece about a MOGO world to others – including those in major decision-making roles – we help create that just, compassionate, sustainable world we seek. Try to make it a habit to regularly write letters and emails to legislators, officials, editors and others who can help enact decisions that can bring about positive systemic change. Let your voice be heard: Write right now! It only takes a few minutes! 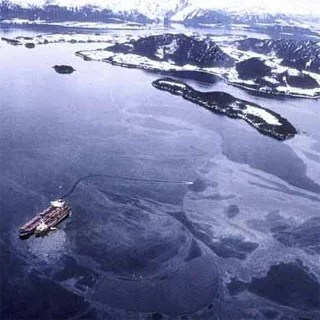 Today marks the 20th anniversary of the Exxon Valdez oil spill, reportedly the largest oil spill in U.S. history. Nearly 11 million gallons of oil poured from a gash in the ship’s hull, spreading out into one of the most pristine and delicate areas of the U.S.: Prince William Sound. The spill eventually covered more than 1,200 miles of coastline, killed millions of animals and devastated numerous communities. Nature has written an article about the spill, reflecting on the disaster and examining the impact that lingers today, and you’ll find plenty of other media coverage. People, animals and the planet are still feeling the impact of that spill. What a great reminder that our actions can have enormous and long-lasting consequences. What a great time to pay attention to all the choices we make that involve the use of oil — not just for transportation, but for our food, the products we buy, and so on. writing your editor, legislators and other people in authority to encourage them to create systems that are sustainable and restorative. Why support something that can cause enormous suffering and destruction (Iraq War, anyone? ), when we can create and use the humane alternatives available to us now, and continue to work for better future alternatives? The MOGO group, after a day of sharing, learning, connecting and eating! I’ve mentioned before that I’m a proud employee of the Institute for Humane Education, but I also volunteered to organize a MOGO Workshop for IHE here in Portland. It was held last weekend, and it was truly an amazing and transforming experience. Two volunteers spend a couple minutes getting the vaguest idea of what life must be like for battery hens. Throughout the day, Zoe used these 7 keys as the basis for helping participants explore, question, reflect, think critically and define their values, the impact of their personal choices and the power of systemic change. Zoe used a variety of interactive strategies during the workshop. She started almost immediately by having people think about and list all the challenges of the world, the ones about which they’re most passionate, and what skills they have for helping solve those challenges. It was a very revealing exercise. Some of the other activities included having people write their epitaphs, share experiences of joy through service and write out their MOGO Action Plan, as well as exploring the impact of our product choices on ourselves, other people, animals and the earth and learning about the ways other concerned citizens are creating positive change in the world. As the local organizer, I was able to invite several of my friends and colleagues, and there were also several people there who didn’t know anything about the MOGO principle but were curious about the concept. Sweetpea Baking Company generously donated some yummy vegan donuts, which were quickly consumed (I jealously snagged a few extra for myself – not very MOGO, I know). And, Papa G’s catered an awesome vegan, organic, mostly-local lunch of enchilada pie, salad, corn, beans and rice, cornbread, and the best pear cobbler I’ve ever had (even better than my husband’s!). We were also fortunate that it was a beautiful, sunny day! Everyone seemed to have a terrific experience (the evaluations were all very positive), and I think people left with a stronger sense of community and purpose, and the feeling that we all indeed can make a powerful positive difference in our lives and in the world. IHE Prez and MOGO Workshop facilitator Zoe Weil. She totally rocks! I’m looking forward to connecting more with the participants and spreading the MOGO principle all over Portland…and the world!